Samsung Electronics, a world leader in advanced digital component solutions, today announced two new additions to its chip-scale package (CSP) line-up: LM101B, a 1W-class mid-power LED, and LH231B, a 5W-class high-power LED. Built with enhanced CSP technology, the new LED packages deliver industry-leading efficacy and reliability for spotlights and high-bay lighting applications. The LM101B and the LH231B packages are based on Samsung’s state-of-the-art, fillet-enhanced CSP (FEC) technology, which forms TiO2 walls around the chip surface to reflect its light output toward the top, acting as a plastic mold in conventional EMC-based LEDs. With their FEC design, the packages provide a higher light efficacy level compared to Samsung’s previous generation of CSP LEDs*. The more focused beam also helps to eliminate cross-talk between neighboring packages and enables the new packages to be placed in close proximity to one another, offering greater flexibility to luminaire designers. The LM101B features the highest efficacy among currently available mid-power CSP LEDs with 200lm/W (Ra80 5000K, 65mA, 25˚C). Furthermore, with low thermal resistance (2K/W) and high reliability (0.5W, 105˚C, L90>50000 hours), the LM101B has been optimized for spotlights and high-bay applications where high efficacy and long lifespan are required. With an operating current of 2A (max. 6W), the LH231B offers an efficacy of 170lm/W (Ra70 5000K, 700mA, 85˚C). This is the same high efficacy level offered by ceramic-based high-power LEDs, one that can bring a high degree of cost-effectiveness when applied to high-bay applications that require an output between 5,000 and 10,000lm. Thanks to Samsung’s FEC structure, the 120-degree beam angle allows for simple optic designs, making it also suitable for outdoor applications, such as street and parking lot lighting. The LM101B and LH231B complement the currently available 3W-class high-power LH181B CSP LED, and the entire FEC lineup is now in mass production. 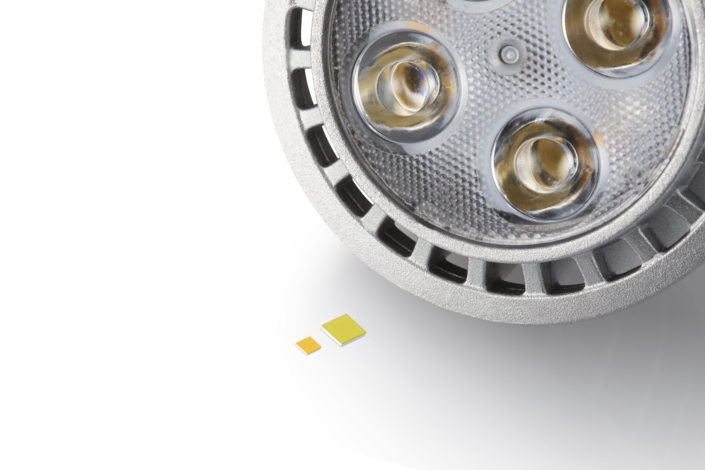 *Editorial Note: Previous-generation CSP LEDs create a wider beam angle by emitting light through the top and side surfaces of a package that has been coated in phosphor film.